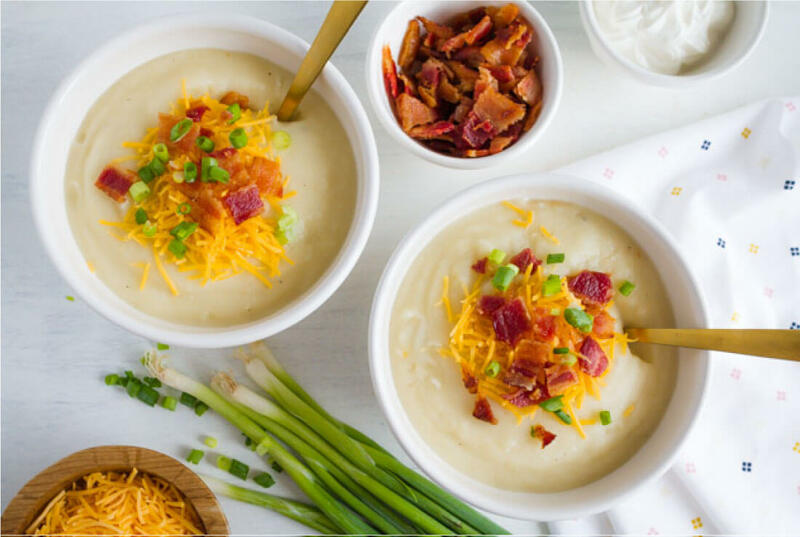 Slow Cooker Baked Potato Soup – this loaded soup has all of the fixings for a chilly day. It will warm you right up! 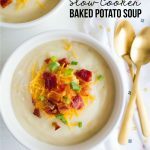 There are several recipes for slow cooker baked potato soup but I combined a few and loved the result. Creamy, hearty and delicious. Of course this recipe wouldn’t be nearly as good without the garnishes- bacon, sour cream, and cheese. But the good news is that you and your family members can add whatever they want. Some kids like sour cream, some don’t. Some love bacon, others don’t. So this one is good for a crowd! One of the things I love about this one is that you don’t have to peel a million potatoes. That is the worst job isn’t it? There’s nothing better than throwing a bunch of ingredients into a crockpot and having it turn into something that tastes amazing. Soups are one of my favorites for the slow cooker. They turn out delicious and make your whole house smell amazing! Wash and cut russet potatoes. Add potatoes, chicken broth, onion and minced garlic to slow cooker. Note: I like to add a slow cooker liner because it makes clean up so much easier! Cook on high or low, following directions below. Using a potato masher or mixer, mash mixture after done cooking. Add half and half plus, stir. How long does baked potato soup last in the fridge? One of the best things about soup recipes is that they taste even better the day after. But how long are they good in the fridge? Each recipe is different, but this one will last for 3-4 days in the fridge. Which means you can get at least 4 helpings in (if you don’t eat it all on the first day!). I’ve made this soup on Halloween to go with my favorite cornbread ever. I put the ingredients in and just left it while I went to the kids Halloween parade. Anyone else love slow cooker recipes? 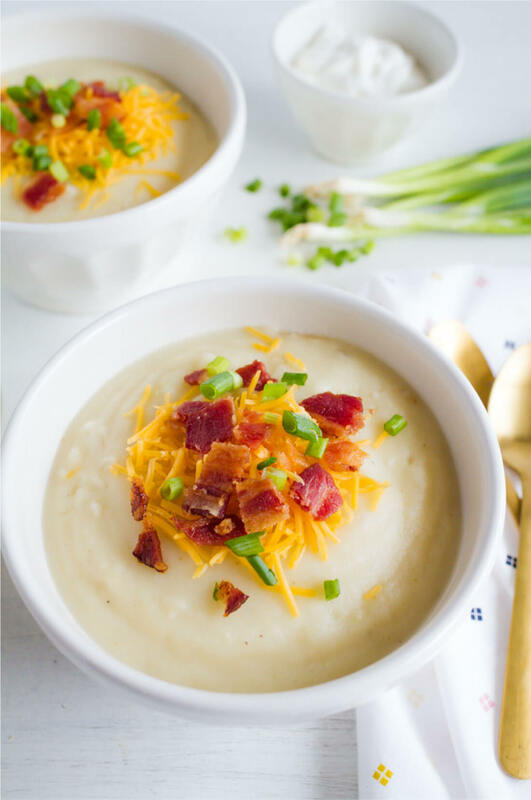 This Slow Cooker Baked Potato Soup has all of the fixings for a chilly day - it’s creamy, hearty and delicious! Put first four ingredients in a slow cooker. Mash mix until soup is slightly thickened. Stir in half and half and cheese. Top with garnishes and additional cheese. When do you add the seasoning salt?? What do u mean by mash mix? I as well as my friends have already been following the excellent hints located on the blog and then all of a sudden developed a horrible suspicion I never expressed respect to the website owner for those secrets. These young men had been totally passionate to read through them and have now honestly been taking pleasure in those things. Thanks for being quite thoughtful as well as for figuring out these kinds of perfect information most people are really eager to discover. My sincere apologies for not saying thanks to earlier. I am hoping to feel like making this tomorrow. Our family has been stricken by the flu and this sounds so wonderful. Thank you. When do you add the Lawrys??? I shared it on my blog as my Favorite Post on 30 Handmade Days. I would love it if you could check it out! I made this last week and it was a hit! Thanks for sharing! Awesome Amy! Thanks for letting me know. Glad you enjoyed it! Just what I have been craving! 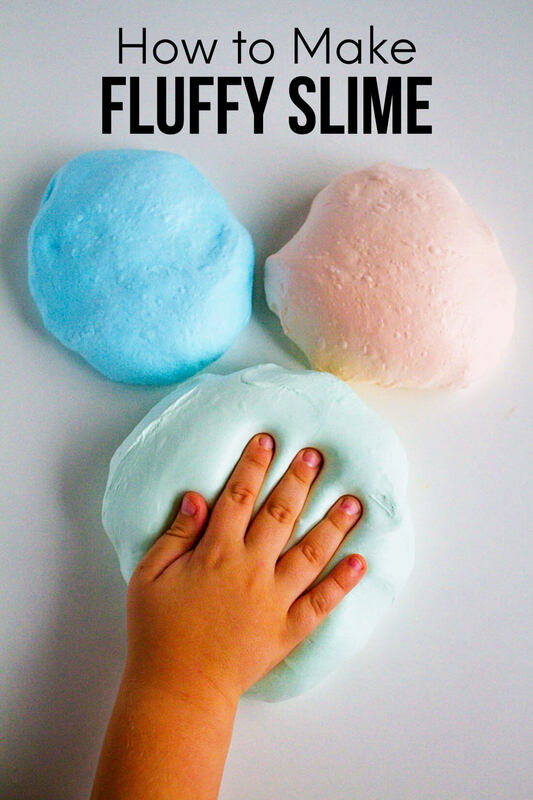 Looks like I will be making this tomorrow!! This looks fantastic! Can’t wait to eat it next week. Perfect timing, I had to buy 20lbs of potatoes for Thanksgiving last week. 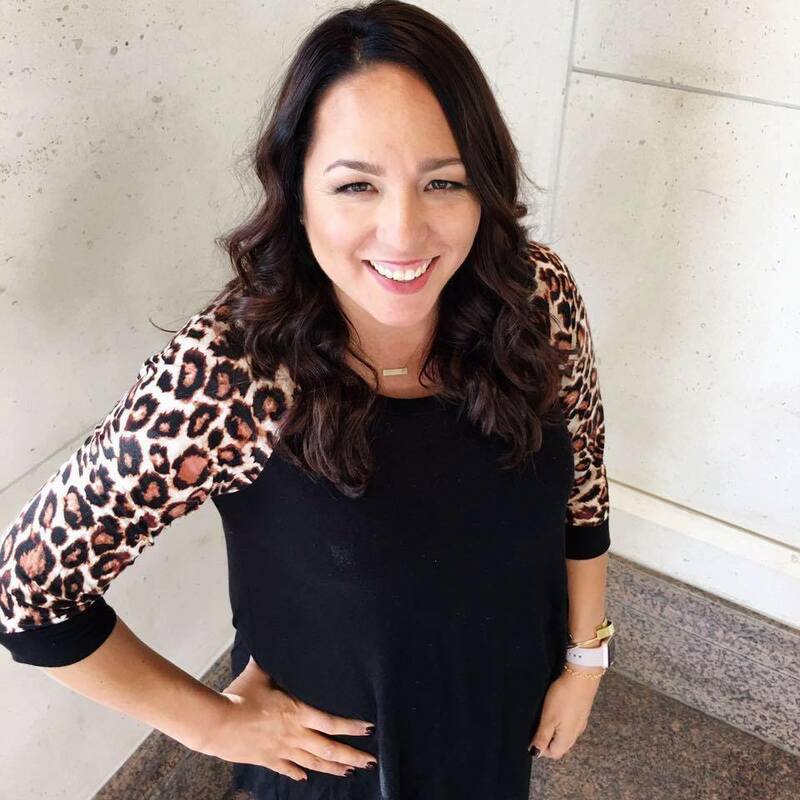 I only used 10lbs…so I need potato recipes and bloggy land comes through again! I love that this is all whole foods and no canned stuff! This sounds so good! 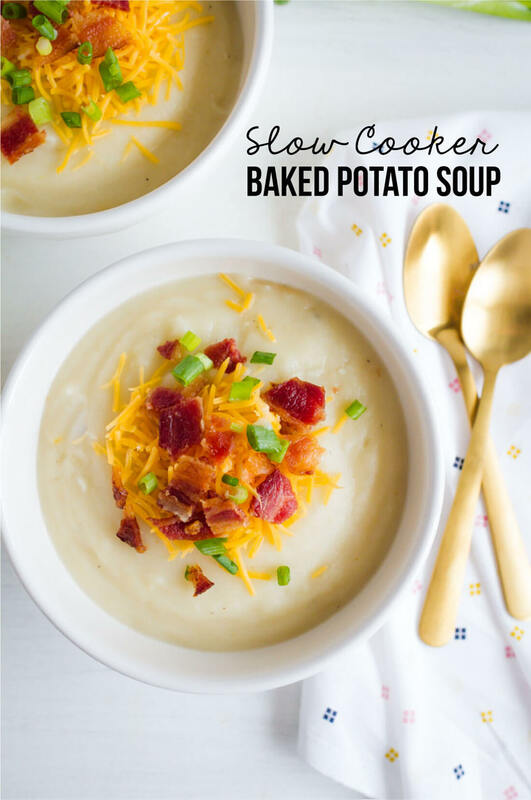 I make potato soup sometimes, but this slow cooker idea sounds very appealing. I think I have a taste for it right now! Thanks! Hi Wendy- ooops! 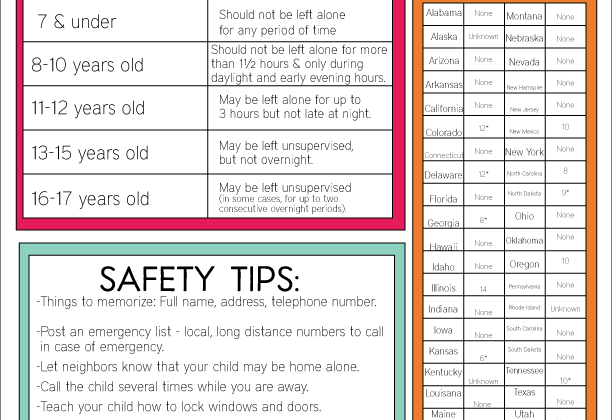 Important details. Thanks for asking. Yes, chop the onions and 1 c. of shredded cheddar plus whatever you want to garnish. Hope that helps!